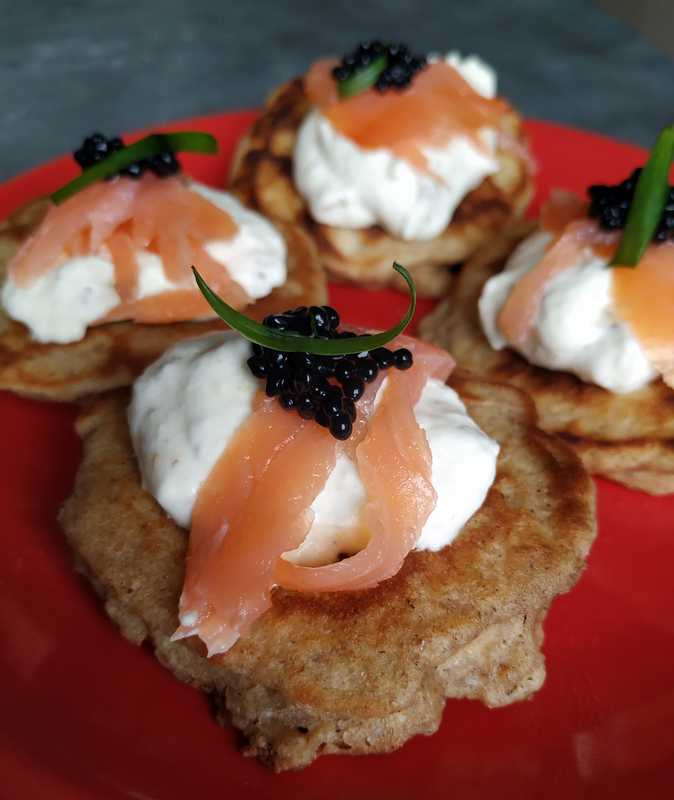 I call these blini (because they’re yeasted pancakes) but I had a friend from Belarus recently tell me that these are call oladyi there and that what I think of as blinz are her blini but whatever you want to call them they’re absolutely delicious and they make the perfect canvas for a variety of toppings! Heat the milk until warm to the touch then add the yeast and sugar and allow to sit for 5-10 minutes until the yeast has activated. In a large mixing bowl, add the flour, egg yolks, and the milk mixture and stir until it forms a thick batter. Cover the bowl and let sit for 40 minutes. In a second bowl whisk the egg whites until they have formed soft peaks. Whisk a small amount of the whipped whites into the blini batter to loosen it, and then carefully fold in the rest using a spatula. Heat a frying pan over a medium heat and add butter then spoon small circles of batter into the pan. When the tops of the pancake bubble (1-2 minutes) flip them and cook on the other side for another 1-2 minutes. Serve topped with whipped cream, smoked salmon, or other additions.